Testing at night is always so much more dramatic. For the PPA2, there is no main chamber to light, so this entire test was primarily focused on exercising the helium spin start system. 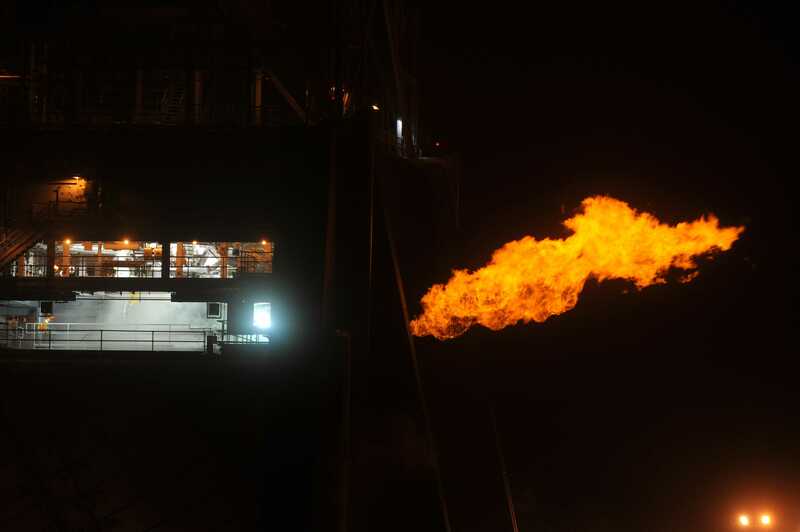 The flames that you see are from flare stacks necessary to get rid of the hydrogen used in the test. Remember, the PPA2 is primarily a test article for turbomachinery and the gas-generator turbine-drive system. It doesn’t make thrust. All of that hydrogen that gets pumped by the fuel turbopump has to be disposed of in a controlled manner other than in the production of thrust. So, we burn it off. The liquid oxygen is disposed of as well, but it doesn’t require anything quite so gaudy as flare stacks. Interestingly, when hydrogen burns, it usually burns clear. The whole orange-flame thing is not something I entirely understand, but it always looks that way at night. There’s some propane in the flame used as kind of like a pilot light, but not enough to cause that much color. It could be that burning hydrogen at such a low mixture ratio (i.e., not enough oxygen immediately available so you get afterburning effects) is the cause of this as compared to the usual white hot rocket engine exhaust. It’s also possible that it’s stuff in the air or somehow water vapor effects, or disassociation effects, but I honestly don’t know. Any ideas from anyone else? I’d love to hear some theories. I do know that if you’re standing anywhere where you can see the flame, you can feel the heat radiating from it. It’s quite an impressive experience. Beyond exercising the helium spin start system, what this test also did is prove out the test stand subsystems, the test stand and test article control systems, demonstrates that the gobs and gobs of instrumentation is hooked up, working properly, and feeding back reasonable data, and that the proper procedures are in place to conduct a safe test. Every facet listed is a big, big deal and has to work in conjunction with everything else. The folks at the Stennis Space Center — civil service, support contractors, and prime contractors alike — all deserve kudos for pulling this off successfully and, really, with minimal technical issues. Way to go guys! This test is yet another in a long string of demonstrations of the power of collaboration and the overall dedication and excellence of the J-2X team. We’re now ready to step into the meat of the test series and start putting the hardware through its paces. This is going to be exciting! Go J-2X! I’ve just realised that earlier I posted a message with links in it, in contravention of policy. SO here’s a quick summary without them. (1) Carbon from some lubricant. I doubt that would be enough, though. (2) Sodium from the salt in seawater. If you are using seawater for cooling – or if seawater is somehow getting onto the structure for some other reason – then sodium might be giving you an orange flame. I agree with Alex. That bright orange color suggests the presence of sodium. The Gulf of Mexico nearby would provide plenty of airborne salt particles to get into and settle on everything. I would guess that in bright ambient conditions during the day, the orange color is washed out and the flame appears colorless. I’ve done a quick check on Wikipedia. K-type stars are made (more or less) of hydrogen glowing orange, and they have a surface temperature of between 3700 to 5200 kelvin. cooler than that drifts towards red rather than orange. The Space Shuttle Main engine burns hydrogen and oxygen, and is certainly not going to be cooler than the flame we have here. It’s temperature is quoted as being 3315 degrees Celsius, or (add 273) 3588 kelvins. And of course, a star’s hydrogen isn’t mixing with oxygen. I would have thought that hydrogen at a temperature of thousands of kelvins pushed out into an O2-containing atmosphere would combust immediately with the familiar blue glow, but (as previously stated) I am not an expert. So on the face of it, the flame can’t be quite hot enough to glow orange, if anything it should glow red, but there does seem to be some wiggle room. Mark, what do you think? Natural gas burns with a blue flame if you mix it with enough oxygen, but looks like that if it is burned in those old gaslights, like you see used for effect around homes, historic buildings etc. You need a chemist to figure out why. Cooler temperature or different chemical reactions? I’m going to guess flame temperature makes some difference in the electron energy orbital change and subsequent frequency of light emitted when they go back to their ground state. Cut as many lights as you can when you don’t need them. That easement is the only semi-dark telescope preserve around Slidell without wasting a lot of gasoline. Some chemist at NOAA discovered that light pollution hinders some nitrate compounds from cleaning up air pollution generated during the day. Who would have thought that? Natural gas is made up of molecules containing both hydrogen and carbon. with enough oxygen, the hydrogen burns to water as steam, the carbon to carbon dioxide, both colorless gasses. In insufficient oxygen, the hydrogen burns but the carbon doesn’t, creating small specks of soot which then glow orange. That’s why such yellow flames leave a black sooty deposit on surfaces above them. Watch footage of a Saturn V launch and you’ll see a long yellow flame coming from the first stage as the stack ascends. That yellow color is coming from unburnt carbon from the kerosene fuel. I think we’ve got to the point where we could really use some input from our esteemed blogmeister. What kind of chemical reaction would heating a big chunk of atmosphere, which is mostly nitrogen and oxygen with the burning hydrogen cause? Any relation to the fireball that rises up into the atmosphere after a nuclear bomb test, or is that caused only by radiation? Every Gas has its own spectra. A gas can emit light when some of its electrons enter lower power states (closer to the nucleas). If they absorb energy (i.e. temperature, photons) then the electrons enter higher states. When they go back to lower energy states, they again emit this light. Now every electron only has discrete states on its way around the nucleus. Changing the states means that a specific amount of energy is absorbed or emitted. The “power” of light is proportional to its frequency. As more power a photon has, as closer it is getting to blue. So, we have electrons changing their states, state change can only be done in discrete steps, discrete steps equal to power, and power to the frequency of light. This leads to the effect, that every gas has its own specific spectrum, or to say color. If you look up hydrogen on wikipedia, you can see its spectrum. You don’t see a red flame on the shuttle, because you don’t look at the flame, much more at the exhaust, which already cooled down to some extent and which is not hydrogen but water. And no some extra: How do we know, that our sun is made of hydrogen? As I said, hydrogen emits red light and can also absorb red light. The sun consists of very hot hydrogen, emitting light at any color, but it is also surrounded by cold hydrogen in the outer spheres. This hydrogen absorbs the specific red light typical for hydrogen. If we look at the color spectrum of our sun, then this red part, typical for hydrogen, was filtered away. In the same way we can determine what galaxies are made of. (google for spectrum sun light hydrogen to see pictures of the spectrum).